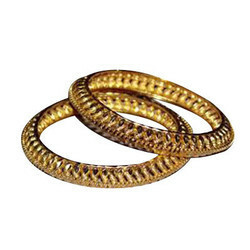 Bangles are part of traditional Indian jewelry. They are usually worn in pairs by women, one or more on each arm. We have designs ranging from simple to intricate designs, studded with CZ and American diamonds, colorstones and Kundans. Bangles completes the Indian Traditional attire of a woman, bracelets are now in vogue to be worn only in one hand, we have a large variety for every occasion–CZ Bangles, CZ Bracelets, Loose Bracelets, Tennis Bracelets, Bridal Bangles, Traditional Kadas, Bridal Bracelets. Clients can avail from us a great range of Bangles molded out of studded gold and decorated with glittering and beautifully cut glass pieces of various colors. This has cut design with carving and can be availed at very competitive price. 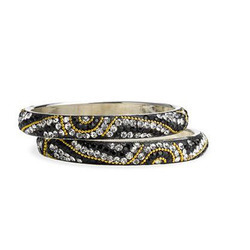 Our range of jewelry extends to range of Fashionable Bangles with several embellishments. Our designer bangles are maintained with highly stylish and fashionable and give an appealing look to the wearer. 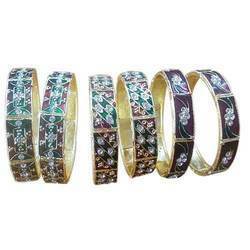 Clients can avail these bangles at reasonable prices. Highly appreciated for their superior quality, durability, glossy appearance etc, we present here high class of Designer Bangles with the designs of captivating floral patterns. This has sophisticated and elegant beads that are placed together in these charming ladies beaded bangles.